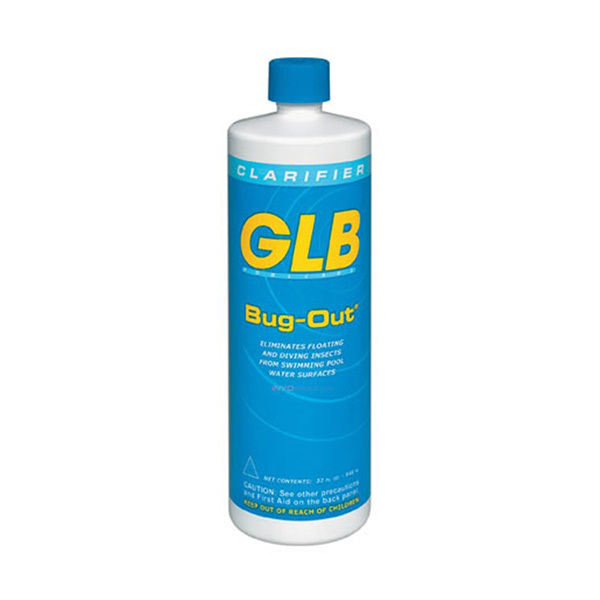 Bug-Out® clarifier prevents insects from gathering on the pool water surface. It reduces the water’s surface tension to allow bugs and other debris to drop to the pool bottom to be vacuumed away. Pour 4-8 oz. of Bug Out for each 10,000 gallons of water directly on the water surface as close to the insect infestation as possible. Bug Out will begin to reduce water surface tension immediately. If infestation is heavy, repeat treatment may be needed. Apply directly to affected area for best results. Occasionally, some foaming in water may occur. Please refer to actual label for other precautions. Chlorine, bromine, mineral purification systems, salt water pools, ozone and biguanide sanitizers. Its unique formula reduces the tension of the water’s surface to allow bugs and other debris to drop to pool bottom where they can be easily vacuumed away.